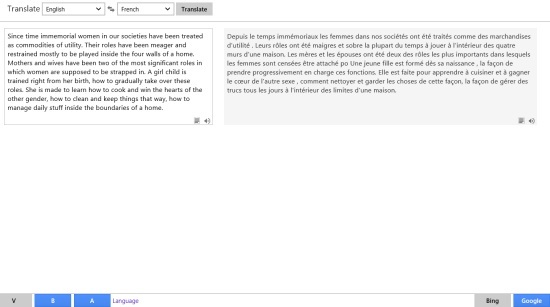 Free Translate 2 is a free language translator app for Windows 8 available under “Education” category of its App Store. This Windows 8 language translator app is a great tool which is based on Bing and Google translator to translate text from one language to other. It means, you can select between the two translators type and the app will translate the text accordingly. You just need to type the text and leave the rest on the app. It will translate the text into the destination language selected. Just keep your Windows 8 PC connected to the internet, and the app will work like anything. V: Enabling the V button lets the app speaks the translated text aloud. B: Enabling the B button tracks the changes which is made on clipboard. For e.g., if you copy any text from anywhere; browser or from any file or folder, the changes made in the clipboard will be automatically updated in the translator app. A: This A button enables automatic translation. Just enter the text and the app will translate it as soon as your enter the text without clicking on translate button. So cool! Translate text from one language to any other language. Based on Bing and Google translator. Text to speech feature available. Identifies the text on clipboard. Well.. I found this language translator Windows 8 app really helpful as it provides many advanced options that you would ever expect from a high-end language translator app. Also, check out our posts on Word Counter Apps, and Language Translator Apps. Open this link in IE10 and click ‘View in Windows Store. You will soon find the app opened in the Windows 8 app store from where you can now proceed with further installation steps. In short, Free Translate 2 is a good utility language translator app for Windows 8 where you can easily translate text from one language to another using various available options. Go ahead and download Free Translate 2 app in Windows 8 now.